NASCAR drivers Chase Elliott, Ryan Blaney, Daniel Suárez and Bubba Wallace will join NASCAR legends Jeff Gordon and Richard Petty as voices in the upcoming film. According to Lylle Breier, senior vice president worldwide marketing partnerships and special events for the Walt Disney Studios, the movie inspired an expanded program with NASCAR. Kicking off at the DAYTONA 500 with the premiere of a new on-air promo, the NASCAR-“Cars 3” collaboration continues throughout the entire race season. * The joint effort will include a variety of marketing initiatives, including digital and social cross promotional activities and sweepstakes. * Throughout the 2017 Monster Energy NASCAR Cup Series, races will feature a “Cars 3” at-track presence via a wide array of promotions. * A co-branded merchandise program with Fanatics — the first of its kind for NASCAR and the “Cars” franchise — will also kick off at the DAYTONA 500 featuring the first film-related product available for fans to purchase. Product will be available at the Fanatics Trackside Superstore continuing at race tracks throughout the season, as well as online at the NASCAR.com Superstore. * NASCAR Acceleration Nation, the sport’s youth program, and the NASCAR Hall of Fame will be featured throughout the duration of a “Cars 3” nationwide tour. * Later this year, NASCAR and Disney will release NASCAR Acceleration Nation and “Cars 3” co-branded in-classroom learning materials for elementary school students. 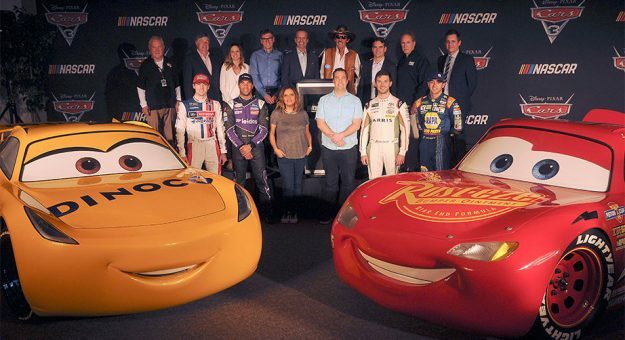 The announcement included the introduction of NASCAR greats — from rookie drivers and legends to the voices behind the sport — tapped by Pixar Animation Studios to voice characters in the film. * CHASE ELLIOTT, 21, was named 2016’s Sunoco Rookie of the Year after finishing last season 10th in the driver standings. Elliott, who pilots the No. 24 car previously driven by four-time champion Jeff Gordon, lends his voice to second-generation Piston Cup racer CHASE RACELOTT in “Cars 3.” Racelott’s blend of skills, track smarts and top-of-the-line technology make this rookie a real contender. * RYAN BLANEY, a 23-year-old, third-generation racer, pilots the No. 21 Ford in the Monster Energy NASCAR Cup series. He voices third-generation racer RYAN “INSIDE” LANEY in “Cars 3.” Known for his racing passion and ability to have fun on the track, Laney races with talent, speed and precision. * DANIEL SUÁREZ, who just turned 25, pilots the No. 19 ARRIS Toyota Camry in the Monster Energy NASCAR Cup Series. The 2016 NASCAR XFINITY Series champion can be heard in the film voicing DANNY SWERVEZ, a next-gen racer who’s ascending the Piston-Cup ladder against all odds. A mid-season replacement, Swervez is a quick learner who pushes himself to the limit. * BUBBA WALLACE, 23, won the NASCAR Camping World Truck Series race at Martinsville Speedway in 2013, becoming the first African-American to win in one of the top three touring divisions since Wendell Scott in 1963. In “Cars 3,” Wallace voices next-gen stock car racer BUBBA WHEELHOUSE, a fast and tenacious young racer who knows how to win. * DARRELL WALTRIP, the NASCAR Hall of Fame racer-turned-NASCAR on FOX color analyst lends his voice to DARRELL CARTRIP. Cartrip, a veteran Piston-Cup announcer also heard in “Cars” and “Cars 2,” may think he’s seen it all — but this new season might still have a surprise or two in store. * SHANNON SPAKE, NASCAR on FOX correspondent and college football and basketball reporter for FOX Sports, voices on-the-track reporter SHANNON SPOKES in the film. Spokes weaves her way into the middle of the action for in-the-moment interviews, and she’s not afraid to ask racers the tough questions. * HOWARD AUGUSTINE “HUMPY” WHEELER JR., the legendary NASCAR promoter and former president and general manager of Charlotte Motor Speedway, lends his voice to iconic Dinoco team owner TEX DINOCO in “Cars 3.” Tex, who met Lightning McQueen in “Cars,” would love nothing more than to see No. 95 decked out in Dinoco blue. * JEFF GORDON, four-time NASCAR champion, current NASCAR on FOX analyst, and story consultant for “Cars 3,” lends his voice to JEFF GORVETTE. Gorvette, whose number of top-10 finishes remains unmatched, may have hung up his racing tires — but his heart remains on the track. His ability to succeed at all levels turned hoods wherever he raced. * RICHARD “THE KING” PETTY, team owner and champion NASCAR driver with 200 wins, returns to the role of STRIP “THE KING” WEATHERS. From his humble beginnings on the Piston-Cup circuit to the glitzy sponsorship and media attention, the champion racer now serves as crew chief for his nephew, Cal Weathers. * KYLE PETTY, retired NASCAR driver and current NASCAR commentator on NBC, helps bring CAL WEATHERS to life in “Cars 3.” Weathers grew up around the track watching his uncle, Strip “The King” Weathers, tear it up. The veteran racer finds himself taking a step back to make room for the next generation on the track. * MIKE JOY is FOX Sports’ lead NASCAR announcer who will call his 38th DAYTONA 500 this Sunday. He lends his iconic voice to on-the-spot radio talk show host MIKE JOYRIDE in the movie. Joyride stays one step ahead in the racing news game by keeping a keen eye on where the racing season is headed. * RAY EVERNHAM, winner of three NASCAR championships as crew chief for Jeff Gordon and current consultant to Hendrick Motorsports, lends his voice to RAY REVERHAM, Jackson Storm’s crew chief, and an expert at training in the cutting edge technology and tactics being used by the next-gen racers. Evernham also serves as a story consultant for filmmakers. NASCAR fans can picture themselves with Lightning McQueen and Cruz Ramirez — or at least life-sized cars designed to look like the big-screen characters. The Cruz Ramirez lookalike premiered in Daytona on Thursday, alongside No. 95 — the Lightning McQueen car made its debut at the North American International Auto Show (NAIAS) in January. Comedian and actress Cristela Alonzo got to hang with her character lookalike at the event. “I am excited to be here as race fans get to see these two life-sized characters together for the first time,” Alonzo said. The Lightning McQueen and Cruz Ramirez lookalike cars are slated to make appearances at select races throughout the season as part of a “Cars 3” nationwide tour. Joining them on the tour will be a lookalike of Lightning McQueen’s on-track rival, Jackson Storm. As previously announced, Owen Wilson, the voice of Lightning McQueen, will serve as grand marshal of the DAYTONA 500 this Sunday, Feb. 26. Wilson has provided the voice of the red car in all of the “Cars” films. Blindsided by a new generation of blazing-fast racers, the legendary Lightning McQueen (voice of Owen Wilson) is suddenly pushed out of the sport he loves. To get back in the game, he will need the help of an eager young race technician, Cruz Ramirez (voice of Cristela Alonzo), with her own plan to win, plus inspiration from the late Fabulous Hudson Hornet and a few unexpected turns. Proving that No. 95 isn’t through yet will test the heart of a champion on Piston Cup Racing’s biggest stage! Directed by Brian Fee (storyboard artist “Cars,” “Cars 2”) and produced by Kevin Reher (“A Bug’s Life,” “La Luna” short), “Cars 3” cruises into theaters on June 16.